It's time to post another finish! I love, love this quilt. I actually started the top several years ago. I saw the pattern in a book I'd checked out from the library and thought it was stunning. I made the blocks pretty quickly and put the top together, intending to make it a baby quilt. The top sat and sat and sat around until about a year ago when I decided to add borders and quilt it. For the past year, it's been hanging on a project quilt rack, waiting for the binding. I don't know why it's taken so long to complete. Maybe it's because I love it so much and I wanted to have a great reason to finish it? That reason presented itself last week when our friend delivered a baby prematurely. Teensy little 2 lb, 4 oz Hudson was born at 27 weeks gestation. This little guy is stubborn and strong - just like his parents - and he's doing well. It's hard to part with my Shadowbox quilt but I'll do it because Hudson needs all things good in his life so he can grow up healthy and strong. You can follow Hudson's journey at Ben and Kim's blog. One of my dear childhood friends has struggled to have a second baby. Several years of emotional ups and downs led her and her husband to adopt a daughter from China so that their son would have a sibling. Fast forward four years and I was thrilled to learn she was expecting (and in her second trimester!) I knew I had to make a special quilt for this little one. Candy was excited about my offer and trusted me to pick out the pattern. She asked for a color scheme to match the nursery - light and dark pink and spring green. I decided on a chevron pattern because it's so modern and Candy loves mid-century style. This quilt is entirely made from my stash - even the back! I wanted to add a little something extra to the back and ended up with the beautiful green strips breaking up the pink. I didn't think about it at the time but now it reminds me of a present which is SO FITTING because baby Gretchen is truly a gift to this special family. Here is a close up of the quilting. It took some time but was well worth it to emphasize the chevron effect. 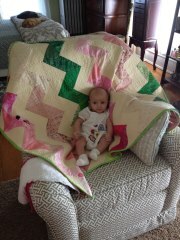 Here is photo of Gretchen with her quilt and her kickass chair. What a lucky little lady. And here I am visiting little Gretchen. She's a cutie! I've had some quilt finishes lately but haven't had the time to get them posted. Since I'm hosting a quilting getaway this weekend, I thought I better get my finished quilts officially out there so that I can hopefully post one or two more after the weekend! This quilt is one of my favorites. My mother-in-law, Bobbie, and I needed to do a baby quilt for a family member. The recipient asked that we incorporate the color of the nursery walls. It was a fairly specific green. Since we didn't have much to go on in terms of requests so we decided to try this pattern, which I saw on Pinterest. I have to say, I got the easy part of this project. Bobbie made the blocks and put them together so she had to figure out the measurements. I just quilted it. It turned out great and I hope to make one for myself some day. Ryleigh's Quilt is One Year Old! It's been quiet around lately. I seem to be working on multiple projects and not actually finishing anything. Hopefully that means I'll be posting lots of finishes soon. In the meantime, head over to check out Ryleigh's Quilt, used in a recent photo shoot for Ryleigh's first birthday. That girl is a cutie!